This article is about the Canadian territory. For its predecessor, see North-Western Territory. For the former U.S. territory, see Northwest Territory. For similar names, see Northwest (disambiguation). The Northwest Territories (NT or NWT; French: les Territoires du Nord-Ouest, TNO; Athabaskan languages: Denendeh; Inuinnaqtun: Nunatsiaq; Inuktitut: ᓄᓇᑦᓯᐊᖅ) is a federal territory of Canada. At a land area of approximately 1,144,000 km2 (442,000 sq mi) and a 2016 census population of 41,786, it is the second-largest and the most populous of the three territories in Northern Canada. Its estimated population as of 2018 is 44,445. Yellowknife became the territorial capital in 1967, following recommendations by the Carrothers Commission. 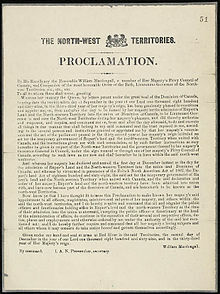 The Northwest Territories, a portion of the old North-Western Territory, entered the Canadian Confederation on July 15, 1870, but the current borders were formed on April 1, 1999, when the territory was subdivided to create Nunavut to the east, via the Nunavut Act and the Nunavut Land Claims Agreement. While Nunavut is mostly Arctic tundra, the Northwest Territories has a slightly warmer climate and is both boreal forest (taiga), and tundra, and its most northern regions form part of the Canadian Arctic Archipelago. The Northwest Territories is bordered by Canada's two other territories, Nunavut to the east and Yukon to the west, and by the provinces of British Columbia, Alberta, and Saskatchewan to the south. The name is descriptive, adopted by the British government during the colonial era to indicate where it lay in relation to Rupert's Land. It is shortened from North-Western Territory (see History). In Inuktitut, the Northwest Territories are referred to as ᓄᓇᑦᓯᐊᖅ (Nunatsiaq), "beautiful land." There was some discussion of changing the name of the Northwest Territories after the splitting off of Nunavut, possibly to a term from an Aboriginal language. One proposal was "Denendeh" (an Athabaskan language word meaning "our land"), as advocated by the former premier Stephen Kakfwi, among others. One of the most popular proposals for a new name – one to name the territory "Bob" – began as a prank, but for a while it was at or near the top in the public-opinion polls. In the end, a poll conducted prior to division showed that strong support remained to keep the name "Northwest Territories". This name arguably became more appropriate following division than it had been when the territories extended far into Canada's north-central and northeastern areas. Located in northern Canada, the territory borders Canada's two other territories, Yukon to the west and Nunavut to the east, as well as three provinces: British Columbia to the southwest, and Alberta and Saskatchewan to the south. It possibly meets Manitoba at a quadripoint to the extreme southeast, though surveys have not been completed. It has a land area of 1,183,085 km2 (456,792 sq mi). Geographical features include Great Bear Lake, the largest lake entirely within Canada, and Great Slave Lake, the deepest body of water in North America at 614 m (2,014 ft), as well as the Mackenzie River and the canyons of the Nahanni National Park Reserve, a national park and UNESCO World Heritage Site. 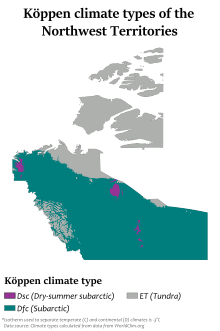 Territorial islands in the Canadian Arctic Archipelago include Banks Island, Borden Island, Prince Patrick Island, and parts of Victoria Island and Melville Island. Its highest point is Mount Nirvana near the border with Yukon at an elevation of 2,773 m (9,098 ft). The Northwest Territories extends for more than 1,300,000 km2 (500,000 sq mi) and has a large climate variant from south to north. The southern part of the territory (most of the mainland portion) has a subarctic climate, while the islands and northern coast have a polar climate. Summers in the north are short and cool, with daytime highs of 14-17 Celsius (60° to 70 °F), and lows of 1-5 Celsius (45° to 55 °F). Winters are long and harsh, daytime highs in the mid −20 °C (−4 °F) and lows around −40 °C (−40 °F). Extremes are common with summer highs in the south reaching 36 °C (97 °F) and lows reaching into the negatives. In winter in the south, it is not uncommon for the temperatures to reach −40 °C (−40 °F), but they can also reach the low teens during the day. In the north, temperatures can reach highs of 30 °C (86 °F), and lows can reach into the low negatives. In winter in the north it is not uncommon for the temperatures to reach −50 °C (−58 °F) but they can also reach the single digits during the day. Thunderstorms are not rare in the south. In the north they are very rare, but do occur. Tornadoes are extremely rare but have happened with the most notable one happening just outside Yellowknife that destroyed a communications tower. The Territory has a fairly dry climate due to the mountains in the west. About half of the territory is above the tree line. There are not many trees in most of the eastern areas of the territory, or in the north islands. 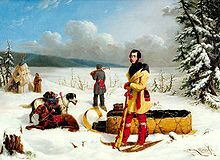 The present-day territory came under government authority in July 1870, after the Hudson's Bay Company transferred Rupert's Land and the North-Western Territory to the British Crown, which subsequently transferred them to Canada, giving it the name the North-west Territories. This immense region comprised all of today's Canada except that which was encompassed within the early signers of Canadian Confederation, that is, British Columbia, early forms of present-day Ontario and Quebec (which encompassed the coast of the Great Lakes, the Saint Lawrence River valley and the southern third of Quebec), the Maritimes (NS, PEI and NB), Newfoundland, the Labrador coast, and the Arctic Islands, except the southern half of Baffin Island (the Arctic Islands remained under direct British claim until 1880). The first residential school opened in 1867 in Fort Resolution, followed by several others in regions across the territory, thus contributing to the Northwest Territories reaching the highest percentage of students in residential schools of any area in Canada. After the 1870 transfer, some of the North-west Territories was whittled away. The province of Manitoba was created on July 15, 1870, at first a small square area around Winnipeg, and then enlarged in 1881 to a larger rectangular region composing the modern province's south. By the time British Columbia joined Confederation on July 20, 1871, it had already (1866) been granted the portion of North-Western Territory south of 60 degrees north and west of 120 degrees west, an area that comprised most of the Stickeen Territories. In the meantime, the Province of Ontario was enlarged northwestward in 1882. Quebec was also extended northwards in 1898. Yukon was made a separate territory that year, due to the Klondike Gold Rush, to free the North-west Territories government in Regina from the burden of addressing the problems caused by the sudden boom of population and economic activity, and the influx of non-Canadians. The provinces of Alberta and Saskatchewan were created in 1905. In 1906, the Parliament of Canada renamed the "North-West Territories" as the Northwest Territories, dropping all hyphenated forms of it. Manitoba, Ontario, and Quebec acquired the last addition to their modern landmass from the Northwest Territories in 1912. This left only the districts of Mackenzie, Franklin (which absorbed the remnants of Ungava in 1920), and Keewatin within what was then given the name Northwest Territories. In 1925, the boundaries of the Northwest Territories were extended all the way to the North Pole on the sector principle, vastly expanding its territory onto the northern ice cap. Between 1925 and 1999, the Northwest Territories covered a land area of 3,439,296 km2 (1,327,920 sq mi) – larger than that of India. 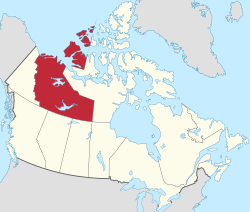 On April 1, 1999, the existing Northwest Territories was split into two parts, with a separate Nunavut territory being formed to represent the Inuit people. The NWT is one of two jurisdictions in Canada – Nunavut being the other – where Aboriginal peoples are in the majority, constituting 50.4% of the population. 1.^ Yukon was ceded from the Northwest Territories in 1898. 2.^ Alberta and Saskatchewan were created from parts of the Northwest Territories in 1905. 3.^ Nunavut was separated from the Northwest Territories in 1999. The largest denominations by number of adherents according to the 2001 census were Roman Catholic with 16,940 (46.7%); the Anglican Church of Canada with 5,510 (14.9%); and the United Church of Canada with 2,230 (6.0%), while a total of 6,465 (17.4%) people stated no religion. French was made an official language in 1877 by the territorial government. After a lengthy and bitter debate resulting from a speech from the throne in 1888 by Lieutenant Governor Joseph Royal the members of the day voted on more than one occasion to nullify that and make English the only language used in the assembly. After some conflict with the Confederation Government in Ottawa, and a decisive vote on January 19, 1892, the assembly members voted for an English-only territory. NWT residents have a right to use any of the above languages in a territorial court, and in the debates and proceedings of the legislature. However, the laws are legally binding only in their French and English versions, and the NWT government only publishes laws and other documents in the territory's other official languages when the legislature asks it to. Furthermore, access to services in any language is limited to institutions and circumstances where there is a significant demand for that language or where it is reasonable to expect it given the nature of the services requested. In practical terms, English language services are universally available, and there is no guarantee that other languages, including French, will be used by any particular government service, except for the courts. There were also 630 responses of both English and a "non-official language"; 35 of both French and a "non-official language"; 145 of both English and French, and about 400 people who either did not respond to the question, or reported multiple non-official languages, or else gave some other unenumerable response. 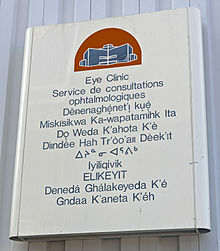 The Northwest Territories' official languages are shown in bold. As of 2014 there are 33 official communities in the NWT. These range in size from Yellowknife with a population of 19,569 to Kakisa with 36 people. Governance of each community differs, some are run under various types of First Nations control, while others are designated as a city, town, village or hamlet, but most communities are municipal corporations. 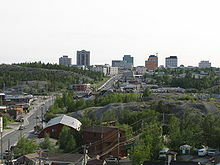 Yellowknife is the largest community and has the largest number of Aboriginal peoples, 4,520 (23.4%) people. However, Behchokǫ̀, with a population of 1,874, is the largest First Nations community, 1,696 (90.9%), and Inuvik with 3,243 people is the largest Inuvialuit community, 1,315 (40.5%). There is one Indian reserve in the NWT, Hay River Reserve, located on the south shore of the Hay River. The NWT's geological resources include gold, diamonds, natural gas and petroleum. BP is the only oil company currently producing oil in the Territory. NWT diamonds are promoted as an alternative to purchasing blood diamonds. Two of the biggest mineral resource companies in the world, BHP Billiton and Rio Tinto mine many of their diamonds from the NWT. 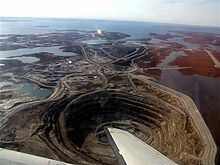 In 2010, NWT accounted for 28.5% of Rio Tinto's total diamond production (3.9 million carats, 17% more than in 2009, from the Diavik Diamond Mine) and 100% of BHP's (3.05 million carats from the EKATI mine). The Northwest Territories has the highest per capita GDP of all provinces or territories in Canada, C$76,000 in 2009. However, as production at the current mines started to wind down, no new mines opened and the public service shrank, the territory lost 1,200 jobs between November 2013 and November 2014. As a territory, the NWT has fewer rights than the provinces. During his term, Premier Kakfwi pushed to have the federal government accord more rights to the territory, including having a greater share of the returns from the territory's natural resources go to the territory. Devolution of powers to the territory was an issue in the 20th general election in 2003, and has been ever since the territory began electing members in 1881. The Commissioner of the NWT is the chief executive and is appointed by the Governor-in-Council of Canada on the recommendation of the federal Minister of Aboriginal Affairs and Northern Development. The position used to be more administrative and governmental, but with the devolution of more powers to the elected assembly since 1967, the position has become symbolic. The Commissioner had full governmental powers until 1980 when the territories were given greater self-government. The Legislative Assembly then began electing a cabinet and Government Leader, later known as the Premier. Since 1985 the Commissioner no longer chairs meetings of the Executive Council (or cabinet), and the federal government has instructed commissioners to behave like a provincial Lieutenant Governor. Unlike Lieutenant Governors, the Commissioner of the Northwest Territories is not a formal representative of the Queen of Canada. Unlike provincial governments and the government of Yukon, the government of the Northwest Territories does not have political parties, except for the period between 1898 and 1905. It is a consensus government called the Legislative Assembly. This group is composed of one member elected from each of the nineteen constituencies. After each general election, the new Assembly elects the Premier and the Speaker by secret ballot. Seven MLAs are also chosen as cabinet ministers, with the remainder forming the opposition. The current Legislative Assembly is the 18th and the most recent election was held November 23, 2015. The Premier is Bob McLeod. The member of Parliament for the Northwest Territories is Michael McLeod (Liberal Party). The Commissioner of the Northwest Territories is George Tuccaro and the Deputy Commissioner is Margaret Thom. In the Parliament of Canada, the NWT comprises a single Senate division and a single House of Commons electoral district, titled Northwest Territories (Western Arctic until 2014). Exact regional borders are undefined. Northwest Territories has eight numbered highways. The longest is the Mackenzie Highway which stretches from the Alberta Highway 35's northern terminus in the south at the Alberta – Northwest Territories border at the 60th parallel to Wrigley, Northwest Territories in the north. Ice roads and winter roads are also prominent and provide road access in winter to towns and mines which would otherwise be fly-in locations. Yellowknife Highway branches out from Mackenzie Highway and connects it to Yellowknife. Dempster Highway is the continuation of Klondike Highway. It starts just west of Dawson City, Yukon, and continues east for over 700 km (400 mi) to Inuvik. Yellowknife did not have an all-season road access to the rest of Canada's highway network until the completion of Deh Cho Bridge in 2012. Prior to that, traffic relied on ferry service in summer and ice road in winter to cross the Mackenzie River. This became a problem during spring and fall time when the ice was not thick enough to handle vehicle load but the ferry could not pass through the ice, which would require all goods from fuel to groceries to be airlifted during the transition period. Yellowknife Transit is the public transportation agency in the city, and is the only transit system within the Northwest Territories. 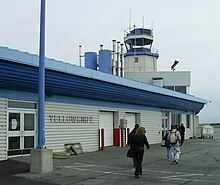 Yellowknife Airport is the largest airport in the territory in terms of aircraft movements and passengers. It is the gateway airport to other destinations within the Northwest Territories. As the airport of the territory capital, it is part of the National Airports System. It is the hub of multiple regional airlines. Major airlines serving destinations within Northwest Territories include Buffalo Airways, Canadian North, First Air, North-Wright Airways. 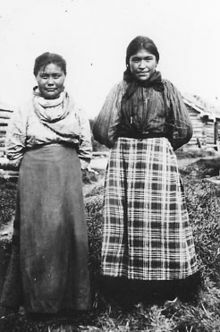 Aboriginal issues in the Northwest Territories include the fate of the Dene who, in the 1940s, were employed to carry radioactive uranium ore from the mines on Great Bear Lake. 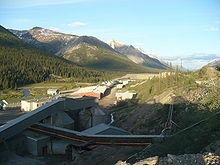 Of the thirty plus miners who worked at the Port Radium site, at least fourteen have died due to various forms of cancer. A study was done in the community of Deline, called A Village of Widows by Cindy Kenny-Gilday, which indicated that the number of people involved were too small to be able to confirm or deny a link. There has been racial tension based on a history of violent conflict between the Dene and the Inuit, who have now taken recent steps towards reconciliation. Land claims in the NWT began with the Inuvialuit Final Agreement, signed on June 5, 1984. It was the first Land Claim signed in the Territory, and the second in Canada. It culminated with the creation of the Inuit homeland of Nunavut, the result of the Nunavut Land Claims Agreement, the largest land claim in Canadian history. Another land claims agreement with the Tłı̨chǫ people created a region within the NWT called Tli Cho, between Great Bear and Great Slave Lakes, which gives the Tłı̨chǫ their own legislative bodies, taxes, resource royalties, and other affairs, though the NWT still maintains control over such areas as health and education. This area includes two of Canada's three diamond mines at Ekati and Diavik. Among the festivals in the region are the Great Northern Arts Festival, the Snowking Winter Festival, Folk on the Rocks music festival in Yellowknife, and Rockin the Rocks. During the winter, many international visitors go to Yellowknife to watch the auroras. Aulavik National Park is in the northern part of Northwest Territories. ^ "What is the official motto of the Northwest Territories?". Assembly.gov.nt.ca. Archived from the original on November 6, 2012. Retrieved February 22, 2011. ^ a b "Land and freshwater area, by province and territory". February 1, 2005. ^ a b "Population and Dwelling Count Highlight Tables, 2016 Census – Canada, provinces and territories". 2016 Census. Statistics Canada. ^ a b "Population by year of Canada of Canada and territories". Statistics Canada. September 26, 2014. Retrieved March 12, 2019. ^ The terms Northwest Territorian(s) Hansard, Thursday, March 25, 2004 Archived March 24, 2009, at the Wayback Machine, and (informally) NWTer(s) Hansard, Monday, October 23, 2006 Archived March 24, 2009, at the Wayback Machine, occur in the official record of the territorial legislature. According to the Oxford Guide to Canadian English Usage (ISBN 0-19-541619-8; p. 335), there is no common term for a resident of Northwest Territories. ^ a b "Population and dwelling counts, for Canada, provinces and territories, 2011 and 2006 censuses". Statcan.gc.ca. February 8, 2012. Retrieved February 8, 2012. ^ Justice Canada (1993). "Nunavut Act". Retrieved April 26, 2007. ^ Justice Canada (1993). "Nunavut Land Claims Agreement Act". Retrieved April 26, 2007. ^ Izenberg, Dafna (Summer 2005). "The Conscience of Nunavut". Ryerson Review of Journalism (online). Toronto: Ryerson School of Journalism. ISSN 0838-0651. Archived from the original on September 21, 2013. Retrieved September 19, 2013. 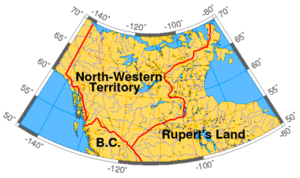 ^ "Northwest Territories looking for new name – "Bob" need not apply". Canada: CBC. January 11, 2002. Retrieved February 22, 2011. ^ "Western Arctic to Northwest Territories: MP calls for riding name change". Canada: CBC. June 25, 2008. Retrieved April 30, 2015. ^ "Tundra for two: dividing Canada's far-north is no small task". Web.archive.org. Archived from the original on April 5, 2005. Retrieved February 22, 2011. ^ Jon Willing. "What about Bob, Water-Lou?". Web.archive.org. Archived from the original on January 18, 2003. Retrieved February 22, 2011. ^ "Top 10 Lakes – Great Bear Lake". ^ Maybank, J. (2012). "Thunderstorm". The Canadian Encyclopedia. The Historica-Dominion Institute. Retrieved September 19, 2013. ^ "Publications & Maps". Globalforestwatch.org. Retrieved February 22, 2011. ^ "National Climate Data and Information Archive". Environment Canada. Archived from the original on November 6, 2012. Retrieved February 29, 2012. ^ "Canadian Heritage – Northwest Territories". Pch.gc.ca. July 13, 2010. Retrieved February 22, 2011. ^ "History of the Name of the Northwest Territories". Prince of Wales Northern Heritage Centre. Retrieved October 17, 2015. ^ "Creation of a new Northwest Territories". Legislative Assembly of the Northwest Territories. Retrieved January 27, 2017. ^ "Canada 2016 Census". Statistics Canada. Retrieved June 25, 2018. ^ Statistics Canada. "Ethnic origin population". Retrieved June 25, 2018. ^ . Statistics Canada, 2005. ^ "2001 Community Profiles". March 12, 2002. ^ "Canada Census 2006". 2.statcan.ca. December 6, 2010. Retrieved February 22, 2011. ^ "Selected Religions, for Canada, Provinces and Territories – 20% Sample Data". 2.statcan.ca. Retrieved February 22, 2011. ^ "Census Profile, 2016 Census". ^ a b "Census Profile, 2016 Census". Statistics Canada. ^ "Census Profile, 2016 Census". Statistics Canada. ^ "Differences in Community Government Structures" (PDF). Retrieved February 22, 2011. ^ "Yellowknife [Census agglomeration]". Retrieved June 25, 2018. ^ "Behchokò - Aboriginal population". www12.statcan.gc.ca. Retrieved June 25, 2018. ^ a b "search: Inuvik". www12.statcan.gc.ca. ^ "2011 Community Profiles – Hay River". www12.statcan.ca. February 1, 2012. Retrieved May 6, 2012. ^ "2011 Community Profiles – Fort Smith". www12.statcan.ca. February 1, 2012. Retrieved May 6, 2012. ^ "Census Profile". May 6, 2015. ^ "BHP Billiton diamond marketing". Bhpbilliton.com. Retrieved February 22, 2011. ^ "Rio Tinto 4th quarter 2010 Operations" (PDF). 2011. Archived from the original (PDF) on January 24, 2011. ^ "BHP Billiton 2010 Annual Report page 124" (PDF). 2010. ^ Government of the Northwest Territories: Industry, Tourism and Investment. "Did You Know?". Archived from the original on July 31, 2010. Retrieved April 10, 2010. ^ Danylchuk, Jack (November 9, 2014). "NWT loses 1,200 jobs since last year: monthly labour report - EDGEYK.com". ^ "NWT Premier asks provincial leaders for backing". Globeandmail.com. Archived from the original on October 15, 2008. Retrieved February 22, 2011. ^ "Transit Route Analysis Study Final Report" (PDF). City of Yellowknife. Archived from the original (PDF) on July 6, 2011. Retrieved March 26, 2009. ^ "A Village of Widows". Arcticcircle.uconn.edu. Retrieved February 22, 2011. ^ "Echoes of the Atomic Age". Ccnr.org. Retrieved February 22, 2011. ^ "IRC: Inuvialuit Final Agreement". Retrieved March 28, 2012. ^ "Agreement between the Inuit of the Nunavut Settlement Area and Her Majesty The Queen in Right of Canada" (PDF). Archived from the original (PDF) on March 24, 2009. Retrieved January 10, 2009. Coates, Kenneth (1985). Canada's colonies: a history of the Yukon and Northwest Territories. Lorimer. ISBN 0-88862-931-1. Choquette, Robert (1995). The Oblate assault on Canada's northwest. University of Ottawa Press. ISBN 0-7766-0402-3. Wikimedia Commons has media related to Northwest Territories.